From the why-didn’t-I-think-of-that department, Newer Technology has created something remarkably simple and yet ingeniously clever. It's a flexible, easy-to-use docking station called the Voyager for Serial ATA (SATA) 2.5-inch and 3.5-inch hard drive mechanisms. If you’ve ever wanted to easily plug your old drives into your current setup, easily and cheaply maintain multiple drive backups, troubleshoot or clone a hard drive, or provide extra data storage for your burgeoning music collection, the Voyager is a great way to do it. 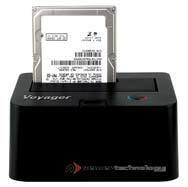 Newer Technology says that the Voyager will allow users to access data from any SATA hard drive up to 2TB. Mac or PC, you simply plug the drive into the Voyager’s dock and it’s conveniently good to go. We tested the Voyager with a half-dozen drives (from Seagate, Maxtor, and Western Digital among others) and they all worked fine. With its four different connectivity options, Newer Technology calls the Voyager a “Quad Interface” dock. The Voyager has ports for USB 2.0, FireWire 400, FireWire 800, and eSATA, and cables are included for each connector. You’ll have to provide your own eSATA card to take advantage of the eSATA connection speeds; there are no Macs that come equipped with eSATA on board, and only the MacBook Pro and Mac Pro can accept such an add-on card. The Voyager is fully bootable and is hot-swappable too. No software drivers are needed. We've seen adapters that could turn internal drives into “external drives” through attachments and a clunky series of wires. This is the first device we've seen that is a convenient, single drive, docking station. The Voyager is a more pedestrian and approachable technology; you have a hard drive and this lets you connect it to your current computer. Pretty simple. As the drive is not completely enclosed, the docking station doesn’t require a cooling fan and runs quietly. A two-toned LED light indicates whether the drive is active or not. It weighs only 1.35 pounds without a drive, thereby making it a candidate for portability, but the plastic doesn’t feel sturdy enough for traveling and is probably best left on your desk. It also comes with a 1-year warranty. The Voyager hard drive dock may not find itself on many wish lists this holiday season, but the Voyager’s pop-in docking technology is a remarkably convenient way to access drives. 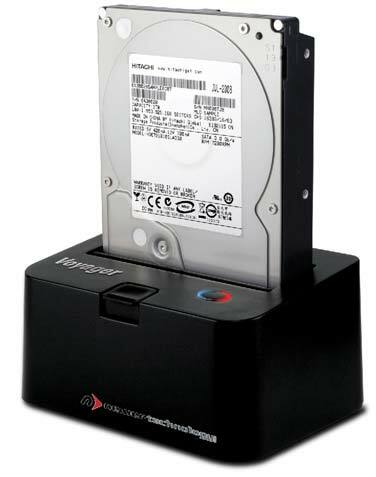 Whether its adding storage space to your current computer or accessing old files from your former, the Voyager provides an easy solution. It may not be the shiniest toy in the store, but its potential is pretty stellar nonetheless.